Waterbucks are so dependent on water that they can’t survive even brief shortages. Despite this dependency, they are almost completely incapable of conserving water. They do not drink extra water when it is available or conserve their urine when water is scarce. 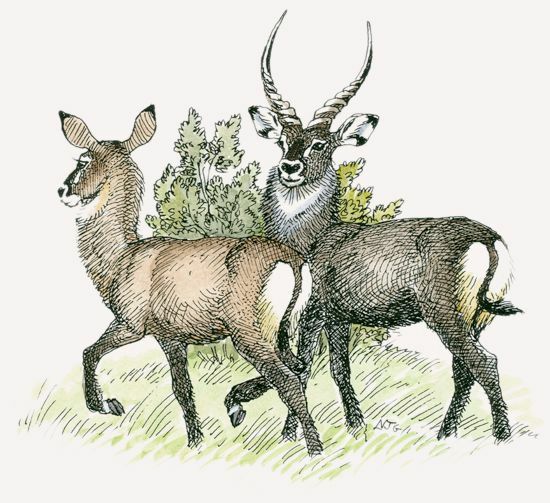 Of the two kinds of waterbucks—defassa and common—only the defassa lives at Mpala. What does the size of a waterbuck’s horns denote? Males with large horns are the most dominant. Males with large horns are the flightiest. Males with large horns are the oldest. The size of a waterbuck’s horns is not at all indicative of an individual’s rank. In fact, males with the largest horns tend to be the most fearful when threatened. Female waterbucks maintain large, often overlapping home ranges. 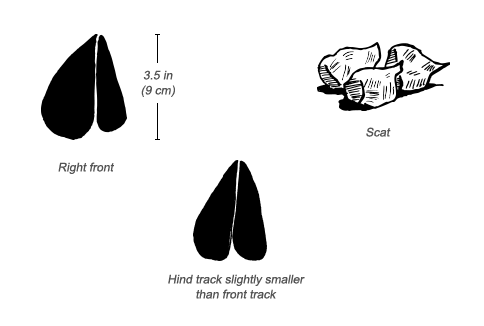 Males live within these ranges, although they have a rather complicated social structure. A territorial male protects his own area within a female’s range, forcing out sub-adult males that don’t submit to him. Bachelor herds are made up of males from within a female’s home range; males from other ranges are not accepted. Young females that are driven away from their mother’s home range form spinster groups. A female stays in this group until she can establish her own home range and find a territorial male for a mate. This can take up to four years. Within all bachelor groups, males spar and compete to display their dominance. Territorial males mark their boundaries through their physical presence and strong body odor rather than with dung or urine. A male generally retains his territory for about five years. Because a large territory is important for securing more and longer visits by females, territorial males continually fight for bigger areas. The largest are obtained when these males are in their prime (between the ages of six and nine years). Once a male is no longer territorial, he tends to lead a solitary life in a small area that he does not have to defend. Except for calves, which make a bleating sound when they are frightened, waterbucks do not communicate vocally. Despite their name, waterbucks do not spend much time in the water. Instead, they spend most of the day and night on land, foraging and ruminating. They rest for about 20 percent of the day, but only four minutes is in heavy sleep (though these times differ somewhat depending on the season). When male waterbucks meet, they display a “proud” posture, which entails a stiffly arched neck and a rigid tail. When another adult male encounters this display, he either submits by lowering his head or the two fight. These fights can last up to 30 minutes, but deaths are rare. 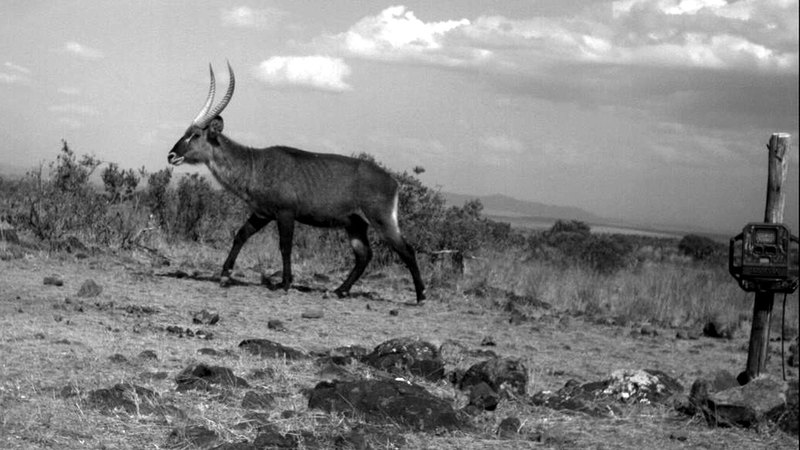 Because waterbucks enjoy grazing on cultivated crops and are rather sedentary in behavior, they are very vulnerable to poaching. 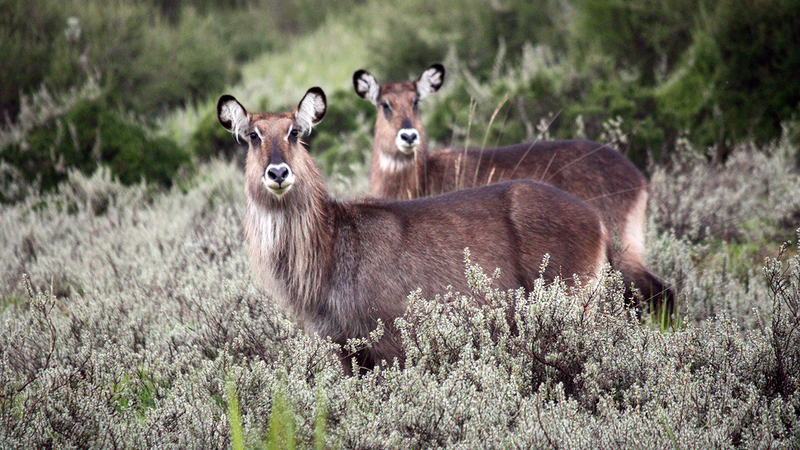 Waterbuck populations are decreasing in half of the countries where they live. South Africa is the only place showing an increase. 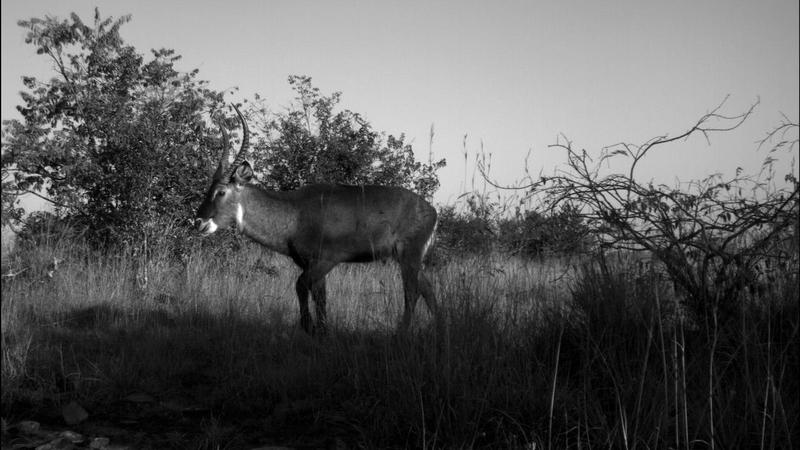 About half of the common waterbuck population lives in protected areas, but even in these regions, there is a 3.2 percent decrease on average every year. Although waterbucks no longer live in parts of their historic range, they still have a presence in 42 sub-Saharan countries. Waterbucks prefer humid areas with scattered bush or woodland that are near a lake or in a valley with lots of water, particularly in the dry season. 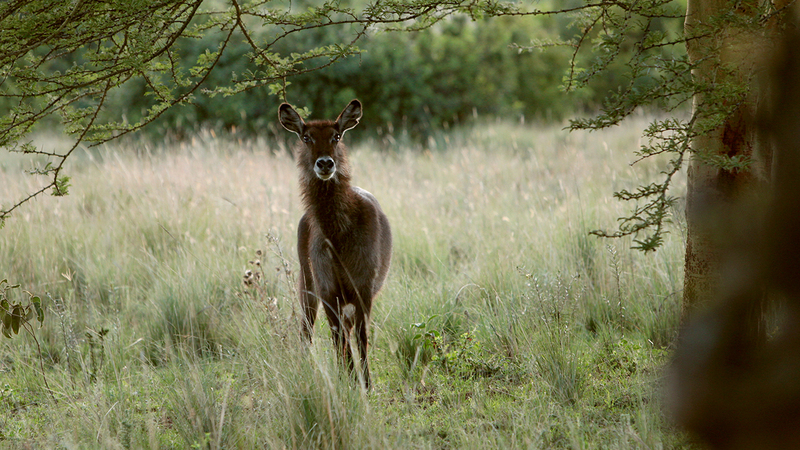 The common waterbuck can tolerate slightly drier habitats, but the defassa waterbuck requires a region that gets an average of at least 30 inches (750 mm) of rain annually. Up of 95 percent of a waterbuck’s diet is grass, particularly short grasses that are rich in protein. 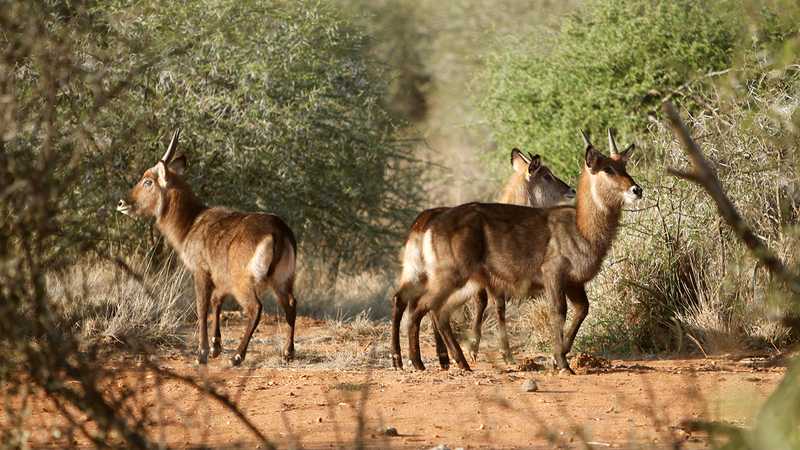 Because the defassa waterbuck requires four times more protein than other grazing bovids, it browses and grazes. Male waterbucks become mature at about three to four years of age, whereas females can bear young when they are about two-and-a-half. When a territorial male is ready to mate, he inspects the females within his territory by nudging their rears. This causes a female to lift up her tail and urinate; the male, in turn, curls back his upper lip in a display called flehmen. At this point, the pair may mate. A female waterbuck has a gestation period of 40 weeks. Two days before she gives birth, she leaves the group and seeks out a birthing spot. Births usually occur in the morning, and newborn calves can stand up and suckle from their mothers within 30 minutes. Calves remain hidden for three weeks, with their mothers nearby to defend and feed them. Offspring are weaned at about 40 weeks of age. Waterbucks face many predators, including lions, leopards, cheetahs, African wild dogs, and Nile crocodiles. Like other ungulates, waterbucks attract ticks; unlike most ungulates, waterbucks barely tolerate the presence of oxpeckers, birds known for eating ticks that have dug into the skin of various mammals. The current estimated population of defassa waterbucks is 95,000; the common waterbuck numbers 105,000. 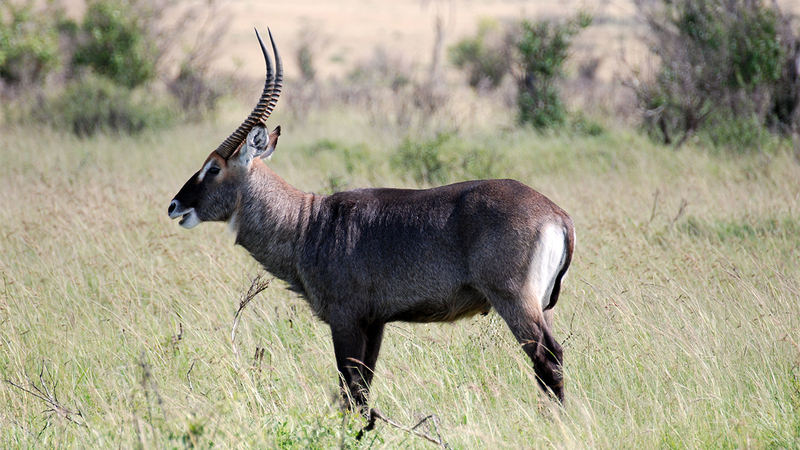 The waterbuck is one of the only mammals that does not conserve its urine when water supplies are limited.